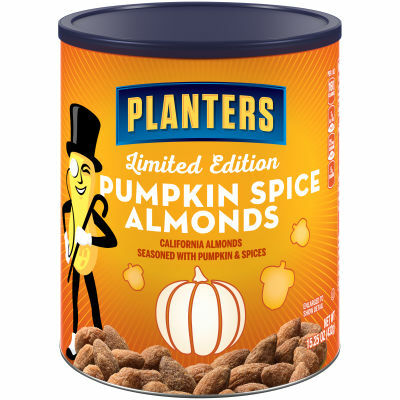 Pumpkin Spice Lovers Rejoice - Experience the taste of sweet and spice with Planters Pumpkin Spice Almonds. A beloved taste that emerges each fall, pumpkin spice provides a lovely sweet taste with a hint of warm spice to remind you of Thanksgiving dinner. - Warm Up Your Taste Buds - The California almonds in this 15.25 oz. can have been dusted with flavors of pumpkin, spices and a dash of sea salt to give you a burst of flavor in every bite. Trans fat-free and cholesterol-free, these seasoned almonds are available in a resealable can that can be enjoyed by the entire family. Serving size 1oz (28g/about 25 pieces).